These next few sections from my memoir, Joy Unspeakable (Part 1; Part II), help describe the shaping of my theology very early on. The pillars on which my Christian foundation rested, were formed between the ages of 5-12. I'm sure many of you can relate. My beliefs were starting to take root as I attended Sunday school each week and learned about God and his son Jesus. My teacher, parents and pastor informed me that the Bible contained the very words of God to mankind. They said that He authored this holy book by telling different people what to write down and they obeyed. So, my very first presupposition, installed by age five, was the notion that absolutely everything in the Bible was true. I would sing confidently each week, “The B-I-B-LE, yes that’s the book for me. I stand alone on the Word of God, The B-I-B-L-E!” I don’t remember even once, questioning or challenging this idea. People in authority said it and I had no reason to doubt. So even when I would encounter paradoxes or contradictions, within the pages, I never questioned its inerrancy. That “truth” always remained in tact and was supported and reinforced throughout my childhood and adulthood. Even stories like Jonah and the whale, Noah’s Ark, or Balaam’s talking donkey, couldn’t dissuade me. God was outside our natural laws and could do anything, especially if he could create the world from nothing. The Bible was my pillar to which all future beliefs would be anchored. When I got my first Bible, my mama wrote in the cover, “Dear Joy, Always remember, this book will keep you from sin, but sin will also keep you from reading this book.” This warning was so simple yet profound and I took her words to be as inerrant as the good book itself. I knew The Holy Bible contained the words to eternal life and I needed to heed its message. I also knew that if I didn’t read it and follow its teachings I would be damned to Hell, so I held the Bible in highest regard and treated it with utmost respect. Donning my rose colored glasses, my perception of the Bible as being perfect in every way went unchallenged, despite the horrific barbarism of the Old Testament, or the irreconcilable challenges that certain passages posed. Any contradictions or threats were easily filtered out through my special god-goggles and I was convinced beyond doubt that this ancient book contained the answers to all of life’s questions and the solution to any problem. It was the “lamp unto my feet and the light unto my path” and nobody could persuade me otherwise. My Holy infallible guidebook provided the blueprint for how everything in the entire universe was made. God did it! From the Creation story in Genesis, I learned that God made the whole world in six days by speaking it into existence. “In the beginning, God created the heavens and the Earth.” All things were made by him and through him. And without him, nothing was made that was made.” And at the end of each creative masterpiece, God proudly declared, “It is good!” I remember in Sunday School, my teacher asked, “Who made the trees?” The class chanted in unison, “God!” “Who made the moon and stars? “God!” Who made people and flowers?” “God!” Who made the air we breathe and the water we drink? “God!” God made every plant and animal in the universe and every planet, star and constellation. To every question related to existence, the answer was “God! God! God!” I secretly questioned this idea when I knew things like houses, clothes, cars and toys were actually made by people and not the result of a “Let there be” voice command from God. It’s fascinating, from a psychological perspective, how I didn’t want to bring it up because it would contradict what I knew from the Bible to be true so I just stuffed the exceptions away and pretended they didn’t exist. Already at age five I was using confirmation bias to support and reinforce my beliefs by only latching on to information or evidence that would support my belief and suppressing or discarding the rest. My God, the creator and sustainer of the universe was all powerful, all knowing, completely good, and had no beginning and no end. He was in charge of everything and everyone on Earth. He was friends with Adam and Eve and even hung out in the perfect, beautiful garden with them, as if he were a person and not a deity. But when they disobeyed, God couldn’t fellowship with them anymore unless they killed an animal and shed blood to cover their sins. They had to cover their body as well because God’s holiness couldn’t allow sin in his presence. Because of Adam and Eve’s sin, the entire earth was cursed and every human inherited a sin nature from the first parents. But then God sent his only son Jesus to be the 2nd Adam who would restore humankind to their original condition by taking away their sins. And everyone who trusts in Jesus and repents is removed from the curse of hell and is granted restored fellowship with God in Heaven. That was the gospel in a nutshell. Creation- Fall- Redemption. This motif explained the condition and solution of the planet. I believed every word of it for the next 47 years. 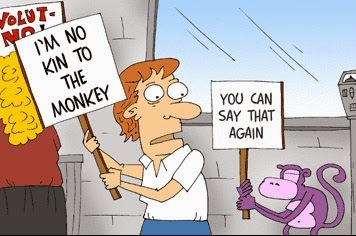 I’m no kin to the monkey, No No No! When I got older, the idea of evolution was shot down before I could even get a reasonable explanation of what it meant. Darwin was synonymous with the Devil and the entire theory was summed up as a crazy, sinister plot by Satan to try and convince humans that they descended from monkeys. Jerry Falwell, a prominent T.V. evangelist warned parents to protect their children from this demonic idea being taught in school. Of course, in my mind, EVERYBODY knew evolution was false. The Bible was the authority on the subject, and it said, Adam came from mud that God shaped into a person and then animated by breathing into his nostrils. Then Eve started out as a rib bone but magically turned into a woman- a much more plausible notion, in my mind than (eye roll) evolving from monkeys, (phfsh!) which, ironically, as we know, wasn’t even an accurate view of evolution in the first place! For several weeks on his Sunday broadcast, Falwell had a group of children singing an anti-evolution song, which he encouraged Christian youngsters to learn, in order to counter the lies they might hear from their teachers. The catchy little song was called, “I’m No Kin to the Monkey.” And of course, my sister and I learned every verse and proudly sang along, truly believing that we were arming ourselves with the best ammunition ever to refute this evil teaching. That humans were monkeys once too. A disgrace to the human race too. Mine didn’t swing from a tree. And that was all it took for me to reject evolution- A preacher on TV (who wouldn’t lie) told me evolution was false, and kids sang a song, making fun of it. My second presupposition was firmly cemented in place, and was no longer open to scrutiny or debate. Along with the infallibility of scripture, the literal account of a six-day creation, as unveiled in the book of Genesis, became another pillar upon which every other doctrine would rest. The monkey’s no kin to me yeah yeah yeah, Any contradictory evidence that challenged my worldview was conveniently filtered out by my rose colored glasses. Confirmation bias was already at work in my brain, enabling me to latch on to evidence that supported my belief while discarding opposing views. If the preacher said it, then I not only believed it, but I embraced it fully and joyfully without reservation. Many children have unreasonable fears of monsters who, purportedly lurk under the bed or hide in the shadowy darkness of the night. But good parents, typically alleviate their youngling’s fears by assuring them, that they are completely safe and that the bogyman doesn’t actually exist. In Christianity, however, it’s the opposite. We were warned that there indeed was an evil presence watching our every move and constantly looking for an opportunity to strike. This invisible force of evil was intent on destroying us, every hour of every day and we needed to be on our guard. Our fears weren’t calmed, but fueled in an attempt to scare us into hyper vigilance. Apart from religion, if any parent ever dared to terrorize their kids by convincing him or her that the imaginary demons hiding in their closet were real, and that their fear was justified, they would be considered horrible parents. And yet, within Christianity it was normal for me to live in a constant state of fear. The Devil was a huge part of the Christian message whether I liked it or not. There were two parallel messages that went hand in hand. Love and worship God and resist the Devil. God loves you and will protect you, but at the same time, be on your guard because the “Devil is roaming around like a roaring lion seeking whom he may devour.” Roarrrrrr! As a young child I perceived God and Satan to be equal rivals, kind of like brothers. Even though I was told that God was more powerful, they seemed to have similar skills. For example, both could be everywhere at once. Both could read and influence minds and even do miracles. When God wanted the Egyptians to free the Israelites, He performed specific signs and wonders. But the magicians, empowered by Satan could do the very same tricks. I didn’t understand why God, who was in charge of everything, seemed to just let Satan run around wreaking havoc everywhere, like a pesky little leprechaun, turning children’s milk green on St. Patty’s Day. In the story of Adam and Eve, God sat back in the shadows and watched while Satan came and tricked them. He let them be deceived and then punished them afterward for listening to the talking snake. So even though I firmly believed that God was big enough to watch over me and protect me, I also believed that God expected me to fight my own battles against Satan. He would give me the tools (the armor of God) but I couldn’t count on him to fight for me. In essence, if I resisted temptation, God got the credit for helping me and if I failed, I got the blame for not resisting. Either way, my rose colored lenses painted God as the deserving object of my complete devotion. If he helped me, I worshipped him for his power. If he didn’t help me, I worshipped him for his mercy by forgiving me for being weak and sinful. God’s glory could not be thwarted even by Satan’s attacks.